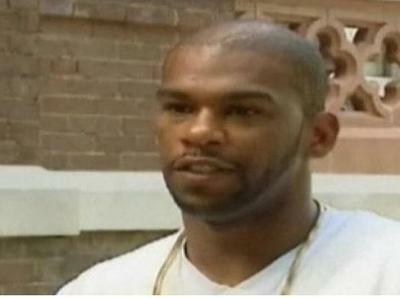 Desmond Hatchett of Tennessee is pleading with the state to help him pay for child support he simply cannot afford. Hatchett, 33, has 11 different "baby mamas" and the state of Tennessee says there is nothing that they can do to limit him from having more children. The state can jail him again, but he has no money. This is why we have a welfare system. So women can get inseminated by him, and collect welfare. (ThyBlackMan.com) Last week, on my facebook page, A Sister asked me if I am “for” or “against” child support. I posted a picture, of a Black woman holding a wheelbarrow full of money, and the words above the picture said “Child Support, Way Better Than A Dad”, then I proceeded to answer the question. What I am “for” is choosing wisely ... What I am “against” is women hustling their wombs SPECIFICALLY for the sole purpose of collecting a child support check. 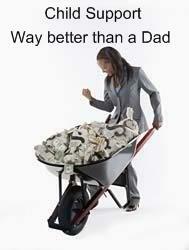 What I am “against” is child support being limited or perceived as just financial assistance. Child support means to support your child mentally, emotionally, spiritually, being there for events, listening to them, encouraging them, showing them love and teaching them lessons so they won’t have to learn lessons in the streets. What I am “against” is Black Men not even given a chance to WILLINGLY give, contribute and add to the life of their child or children, before the Mother of his child (or children) runs down to the overseer to handcuff him with a child support order. I am “against” Brothers being violated in such a system that was designed to destroy the Black Family and children being treated as assets and property of the Mother, with no regard to the Father. I agree that the system was designed to destroy the Black Family. Update: The LA Times says "Some of the mothers of Hatchett's children get only $1.49 a month". It wasn't designed to do anything BUT destroy the Black famly ? Yes, it was also designed to make blacks dependent on the govt and vote Democrat. What about these Black men that are being destroyed by the government with child support ? Why would they be inclined to vote Democrat ? Aren't there more whites dependent on the government than Blacks ? The black men continue to vote Democrat because they have been told that the racist Republicans will not vote them as much govt benefits. Yes, there are more whites than blacks on welfare, and they vote Democrat also. Is it true that the racist Republicans will not vote them as much benefits ? It is true that Obama and the Democrats have vastly increased welfare benefits. Democrats usually favor racial quotas while Republicans favor race-neutral policies. "Some of the mothers of Hatchett's children get only $1.49 a month". Do you think that the $1.49 a month is because of Obama and the Dems. racial quotas or the Repub.s race neutral policies ? I think that those moms were happy to get pregnant because they were going to get welfare benefits from Obama and the Democrats. Hatchett is being squeezed for everything that he can pay. I don't know why 11 different women got pregnant and if it had anything to do with them getting welfare benefits or not.